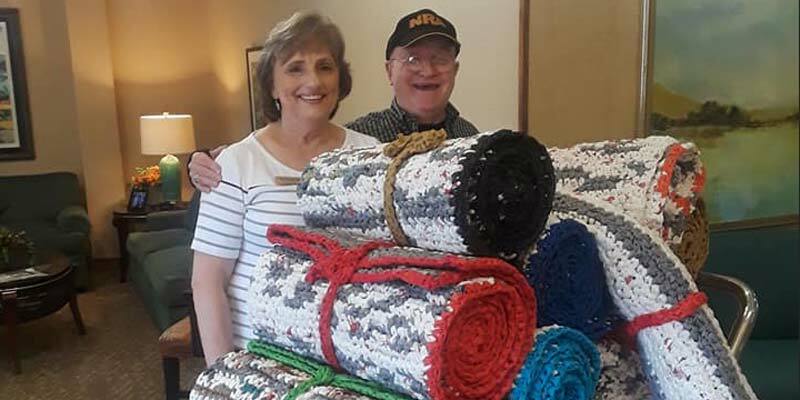 This year, resident Lorraine of Emerald Oaks in San Antonio and Kelly Alonzo, the community's Lifestyle Director, have worked to transform over 17,000 discarded plastic bags into mats using crochet needles. The community donates the mats to Church Under the Bridge, a church in nearby Waco, Texas, that distributes them to the homeless men and women it serves to use as sleep mats. Lorraine: What inspired us to start this project was that we wanted to do something for the larger community. I’d made little blankets for preemie babies before, but then one of the other residents here had previously made mats like this for her church in Oklahoma City. She got sick and had to step back so Kelly put me in charge. Kelly: For months, she’s been working round the clock making them. They’ve been such a labor of love. Lorraine has been the one crocheting them with a giant crochet needle but volunteers have come to the community to learn how to flatten and cut the plastic bags so they’re ready to be crocheted. Lorraine: My helpers make the “flarn,” which is plastic yarn. You have to cut off the ends of the bag and cut them into strips two and half inches long. Then you tie those strips together to make the flarn. Kelly: Lorraine and her husband Jim have been working on them for so long now. They’re like artwork, like a beautiful blanket. Lorraine: I learned how to make them on YouTube. I really like to crochet, and I like to feel like I’m doing something useful for somebody else. Kelly: So many residents helped by donating bags. Even our local Boy Scouts troops were donating. It was an effort on the part of many!